Over the last twenty years research on the Reformation in Germany has shifted both chronologically and thematically toward an interest in the ’long’ or ’delayed’ Reformations, and the structure and operation of the Holy Roman Empire. Whilst this focus has resulted in many fascinating new insights, it has also led to the relative neglect of the early Reformation movement. 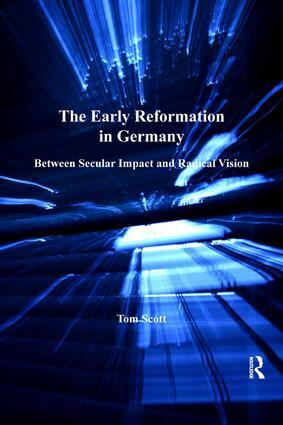 Put together with the explicit purpose of encouraging scholars to reengage with the early ’storm years’ of the German Reformation, this collection of eleven essays by Tom Scott, explores several issues in the historiography of the early Reformation which have not been adequately addressed. The debate over the nature and function of anticlericalism remains unresolved; the mainsprings of iconoclasm are still imperfectly understood; the ideological role of evangelical doctrines in stimulating and legitimising popular rebellion - above all in the German Peasants’ War - remains contentious, while the once uniform view of Anabaptism has given way to a recognition of the plurality and diversity of religious radicalism. Equally, there are questions which, initially broached, have then been sidelined with undue haste: the failure of Reforming movements in certain German cities, or the perception of what constituted heresy in the eyes of the Reformers themselves, and not least, the part played by women in the spread of evangelical doctrines. Consisting of seven essays previously published in scholarly journals and edited volumes, together with three new chapters and an historical afterword, Scott’s volume serves as a timely reminder of the importance of the early decades of the sixteenth century. By reopening seemingly closed issues and by revisiting neglected topics the volume contributes to a more nuanced understanding of what the Reformation in Germany entailed.